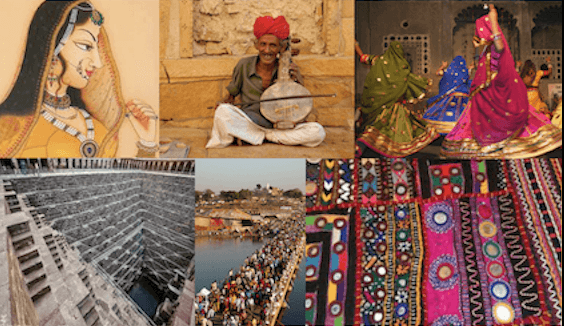 Rajasthan is a hub of folk art, theatre, music, dance and craft. 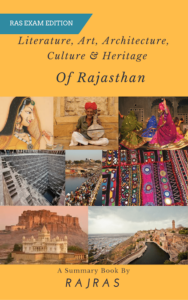 The tribal culture of Rajasthan has done much to preserve and nurture the folk theatre tradition of Rajasthan. Khayal is the most prominent form of folk theatrical form of Rajasthan. Other important folk theatre includes Swang, phad, Rammat, Nautanki, Bhawai, Gavari etc. The subject of Khayal is usually mythological story or an ancient episode. Tamasha a folk-drama began in Jaipur state during the times of Maharaja Pratap Singh for the first time. The Bhatt family of Jaipur included Jaipuri Khayal and Dhrupad Gayaki (style of singing) in Tamasha Theatre. Tamasha is performed in an open stage called as Akhada. This drama originated about 140 years ago in Bikaner region through a folk-poetry competition. The characters playing this musical drama are known as Khelar. A devotional song in praise of Ramdev ji is usually sung before starting Rammat. The main instruments of Ramat are Nagada and Dholak. The songs of this drama are mainly connected with Chaumasa, rainy season, Lavani and Ganapati Vandana. This type of drama is mostly performed in Bikaner, Jaisalmer & Phalaudi regions. Phad is a life-sketch of Some Lok Devta depicted on a cloth. While reciting Phad, Bhopa plays Jantar or Ravanhathha musical instrument. Braj language (Dialect of Hindi language) text ‘Hasyarnava’ written by Rasarup or Kamarup is considered the first written text written for Swang theatre between 1686 and 1689. Swang theatre has good combination of dance, songs, dialogues, mimicry (Nakal) and presentation of dance-drama. The performer of Swang is called Behrupiya. Gavari is style of drama of Bheels of Mewar region. Gavari is played as part of festival that continues for 40 days during months of July-August. Hero of Gavari dance is an old man who is supposed to be incarnation of Shiva. Major themes of Gavari are – Devi Ambad, Badshah Ki Sawari, Banjara, Khadaliya Bhoot and fight lion & pig. Nautanki is performed in the region of Bharatpur, Karauli, Dholpur, Alwar and Gangapur city. The story plot of the Nautanki is generally based on mythology, historical narrations, folklores, romances and contemporary Socio-Political issues. Bhavai folk theatre of Rajasthan is very similar to ‘Swang’ folk theatre and considered its origin near about 13-14th century in Apabhramsa Jain religious verses. Baagha ji was the father of modern Bhawai in Rajasthan. A major play written in Bhawai style is Shanta Gandhi’s – Jasma Oden. Gandharvas are resident of Marwar. Their themes are based on Jain Sect. Anjan Sundari & Maina Sundari are two dramas performed in this style. Raas Leela is staged based on stories of Puranas. Leela’s or acts of Krishna are performed. The main character is called Raasdhar.